The largest island of the Cyclades, in the Aegean Sea, has constituted a place of significance since the prehistoric era and, according to mythology, is where Zeus was raised. Nowadays, Naxos fascinates its visitors with its rich historical and cultural achievements, its natural beauty, as well as its developed tourist infrastructure. Here we present some of the must-visit places in this glorious Greek island. The Archaeological Museum of Naxos is located in Chora Naxos, the heart of the island. It is located in a well maintained Venetian building, dating back to the 17th century and is of special architectural interest. The museum hosts objects and artefacts from the period between the Neolithic and the early-Christian periods. The consecutive civilizations that flourished are represented by a rich collection of ceramics, statues, vessels and idols that will fascinate you. The Geological Museum was established in 1964 and initially operated for four years, until 1968. It was reestablished in 1987, several years after the end of the Greek dictatorship, after the initiative of Manolis Glezos who donated his personal collection of rock formations and fossils. The museum attracts many visitors every year with its rare exhibits, which include emery, the famous local dark marble, meteorites and fossils, which even date back to 70,000 years ago. Portara is the large marble gate dominating the isle Palatia, which is nowadays connected with Chora Naxos, and is the only remnant of the temple dedicated to Apollo, which dates back to the 7th century BC. Of course, we’re talking about the trademark of Naxos and the first thing you’ll see from the boat as you approach the island. The gate, called Portara, may be a small part of the never-finished temple, but it’s all your imagination needs to recreate the glorious ancient Greek past. During the ancient times, the Greek islands of the Aegean and the Ionian sea were surrounded by fortresses in order to be protected from pirates and foreign invaders. The same applies in the case of Naxos, as the island’s architectural identity includes a large number of Venetian fortresses. All these fortresses were built using Naxian stone, with sculptures on their surface, which proves that we’re not only talking about a way of protection, but also about significant cultural monuments. The most famous fortresses of Naxos are the Tower of Glezos in Chora Naxos, the Tower of Fragopoulos in Kourochori and the Tower of Agia next to the homonymous monastery. 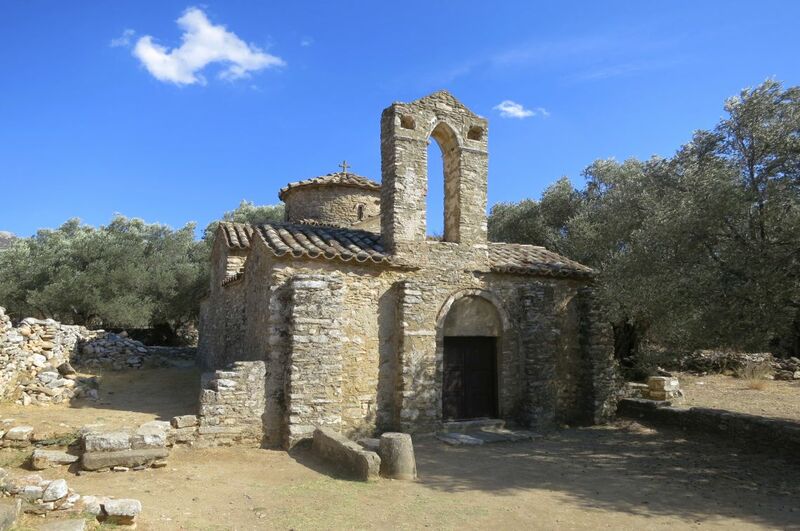 One of the most important pre-Christian temples of the island was built in the area between Tragaia and Moni during the 6th century. Panagia Drosiani is dedicated to ‘Virgin Mary of the rain’, who according to the tradition, answered the prayers of the locals who asked her help with a drought that afflicted the island for years. On the temple’s walls you will see well-preserved paintings, which date back to the period between the 7th and the 14th century, and represent various saints and Jesus Christ.